Welcome to the Gateway Blue Star Mothers MO04 (MO0044P)'s Wreaths Across America Page. On Saturday, December 14, 2019 at 11:00 AM, Gateway Blue Star Mothers MO04 (MO0044P) will be helping Jefferson Barracks National Cemetery to Remember and Honor our veterans by laying Remembrance wreaths on the graves of our country's fallen heroes. Thank you so much for supporting the Gateway Blue Star Mothers MO04 (MO0044P) and Wreaths Across America! Check out 141 "Remember" recent messages from our supporters. Click "View Remember Wall" to see them all. 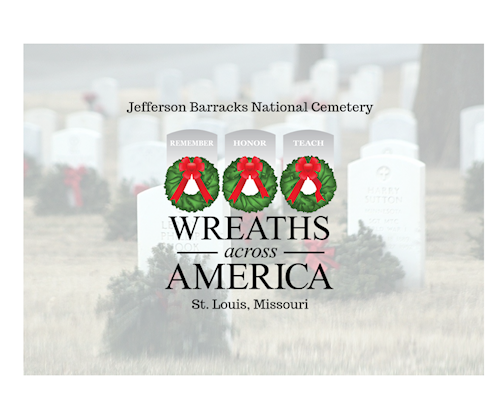 Location Coordinator: Janelle E.,Kathy S.
We are happy that you are willing to help with our Wreath Across America ceremony at Jefferson Barracks National Cemetery. Please do not forget to register to volunteer! That way you will get all updates about the cemetery itself.